For only $25 you too can own a 40" tall sentry turret. The only caveat? It's inflatable. Drastic times call for drastic measures, friends of Science. Aperture Science had to make some cutbacks to the production line when OSHA shut down the main plant. Something about air quality or lead paint in the water pipes. Silly, really. That's what waivers are for. Anyhoo, we can't get you any real, bullet-firing turrets, but we did manage to hijack a pool float factory long enough to make a bunch of these inflatable ones. Fill this 40" turret with all the hot air in your lungs (just think about life giving you lemons) and then position it wherever you need more protection: outside your baby's room, in front of the pie that's cooling, or by your swimming pool to keep the neighborhood kids at bay. Practice your best rendition of "Target acquired" and watch as people run away in fear. Honestly, that sounds pretty cool. 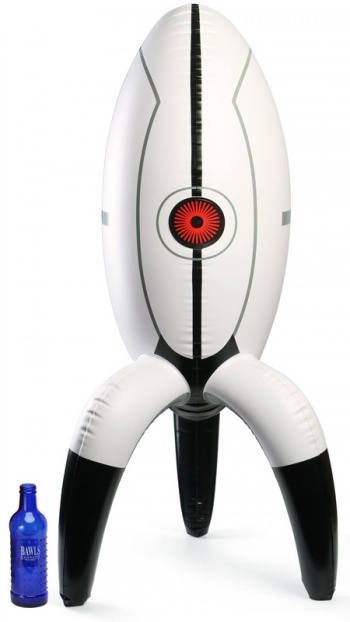 If nothing else, it would make a solid decoration, and the artwork on the inflatable itself is an excellent recreation of Valve's sentry turret aesthetics. That said, we've seen better turrets over the past year. First there was Leigh Nunan and Jonathan Guberman's talking plush turret that was equal parts nostalgically heartwarming and genuinely adorable. Then, less than a month later, we found this spot-on, talking turret replica crafted by prop maker Ryan Palser whose only differentiation from Valve's original turret design was its lack of fully automatic machine guns. On the other hand, neither of those two examples are available for purchase, so maybe you are better off picking up one of ThinkGeek's inflatable offerings. At least you don't have to worry about it cooing at you every time you walk into the room.